Forza Horizon 4 Preview - Rev Your Engines! Home Preview Forza Horizon 4 Preview – Rev Your Engines! Forza Horizon 4 Preview – Rev Your Engines! 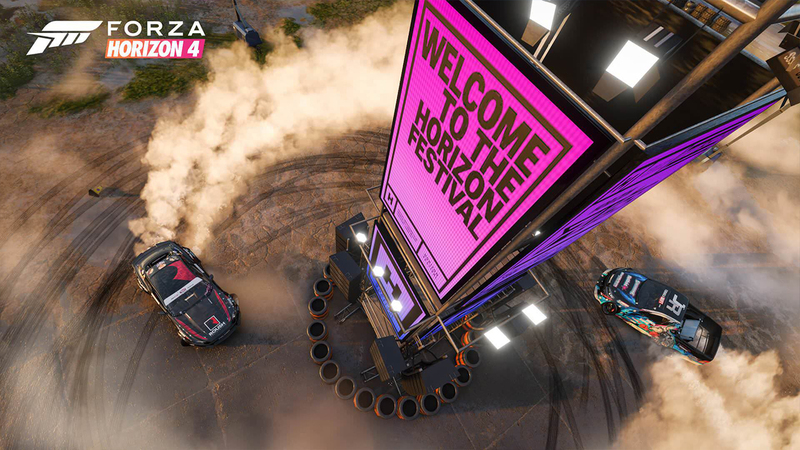 Forza Horizon 4 is the fourth instalment in the successful Forza Horizon car game franchise by Playground Games, which is set to release on 2 October 2018. The demo was released a month earlier than the full release of the game, much to the surprise of fans worldwide. The demo allows for only 10 hours of playtime and offers restricted access to particular zones within the game’s much larger world. From a first time Forza player, this game seems to hit all the nails on the head in regards to a chilled-out gaming and playing experience. In the time that I played I didn’t engage with any of the in-game races or systems that had been set up but instead chose to drive around the map and explore the world as the level of detail on the cars and within the environment was enough to keep me very happily entertained for hours. One of the first things I noticed about this game was the amazing graphics and colour scale. It starts off with an introduction to its season-changing environment, allowing you to take a brief drive through each of the four seasons. Whether it be crystal lakes or towns covered with golden leaves, you won’t be able to miss the amazing details that the Forza dev team has put into this game. Another thing to note is the details within the driving itself; there are up to six different driving views that really immerse you in the experience when on the open road. The road responds to the different car treads on your vehicle, from sliding to drifting over the road, this little detail makes for a unique driving experience each and every time. During your time driving around you encounter other NPCs that display friend’s gamertags. This could lead to a fun and social experience in the live game when your friends are playing at the same time, allowing for you to interact and invite each other into races and social driving within the game. One thing that I am really enjoying about Microsoft games recently are the multi-platform capabilities, allowing for you to play them on any of their compatible systems, whether that be on a Windows 10 PC or on Xbox. As long as you have the game downloaded on any one system, you will be able to easily jump over to another system and play on it upon Forza 4s release. Overall I didn’t really have any issues throughout my experience with the beta of Forza Horizon 4. My only issues with betas and demos is that they often don’t reflect the full game, due to the beta format. I felt that while the details were exceptional, the game was slightly lacking in quantity of content with both the variety of cars and environmental gameplay experiences. Hopefully there will be many more options once the official game goes live, however I am concerned that what we see in the beta is what we will get. I can’t really see myself playing Forza Horizon 4 as my main game as personally, this isn’t something I could get invested in long term. But if you enjoy kicking up your feet and relaxing then this is a perfect game for you. Previous articleAre you ready for Dublin Games Festival this November?